In a new online publication Ensor specialist Xavier Tricot discusses the unknown painting Squelette arrêtant masques (Skeleton Arresting Masqueraders). 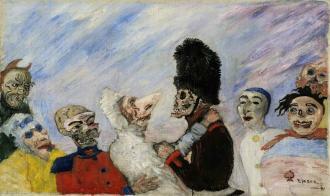 James Ensor painted it in 1891. The work is painted with oil paints on canvas and measures 33 by 55 cm. It is signed and dated on the lower left as: ENSOR/1891. The painting is mentioned in the list of works published in the monograph of Emile Verhaeren (1908), as well as in the monograph by Grégoire Le Roy (1922). As far as Tricot knows, the work was never exhibited. It also remains unmentioned in Ensor's letters. As with various works, it seems here that Ensor found pleasure in the 1890's with the depiction of cryptic allegories of which the meaning is ambiguous.